It’s all in the detail – this luxury boutique property has recently been restored to an exceptional level. From the lounge and dining areas through to the beautifully appointed suites, each area has a warm and inviting feel making it the perfect escape. 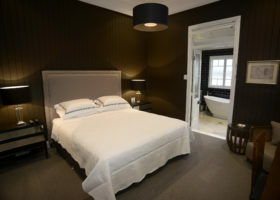 Situated at the front of Heal House, the Master Suite invites you to relax and indulge, with a rich, warm colour scheme and opulently-appointed furnishings. The largest suite flows beautifully from the bedroom with plush King Bed, to the magnificent ensuite with a large, standalone bath for ultimate serenity. A leisurely escape awaits you with the Executive Suite. 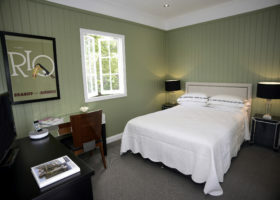 Peacefully located at the back of Heal House, the gorgeously-furnished Executive Suite offers total comfort, from the luxurious Queen Bed and large sash window overlooking the lawn to its spacious dressing room and beautiful ensuite. The Verandah Suite is our smallest and most secluded room, offering complete privacy and tranquility in a lovely, light-filled setting. 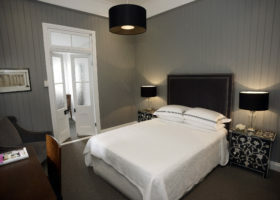 The large window offers garden views from the writing desk and Queen Bed, while charming frosted-glass French Doors separate the bedroom from your ensuite.A small wardrobe is contained within the ensuite.